Save Our Shores! 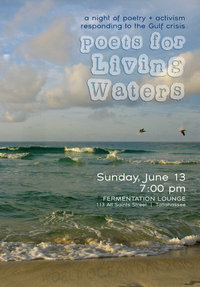 Florida is sponsoring an evening of activism and poetry in Tallahassee, Fl on Sunday, June 13, 2010 at Fermentation Lounge (113 All Saints St.). This poetry reading and activist event has many purposes. First, it is a response to the oil disaster. Second, it is a celebration of our natural waterways and finally, it is a call to action. 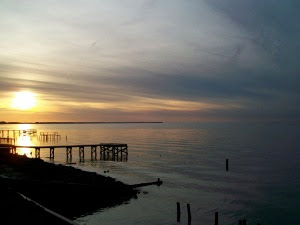 Poets for Living Waters is a poetry action in response to the BP oil disaster in the Gulf of Mexico begun on April 20, 2010, one of the most profound human-made ecological catastrophes in history. Former US poet laureate Robert Pinsky describes the popularity of poetry after 9/11 as a turn away from the disaster’s overwhelming enormity to a more manageable individual scale. As we confront the magnitude of this recent tragedy, such a return may well aid us. This online periodical is the first in a planned series of actions. Further actions will include a print anthology and a public reading in Washington DC. To donate to our efforts to protect the Florida marine environment, follow this link. For more information on the event, please join the event page on Facebook here.